Merry Christmas! We hope that your holiday was as relaxed and enjoyable as ours was. Like this year's Thanksgiving, we spent our first married Christmas in Chicago together. It was low key and quiet-- definitely not how I would describe my Christmases past, but a wonderful way to celebrate at the end of such a busy year for the two of us. This is me. 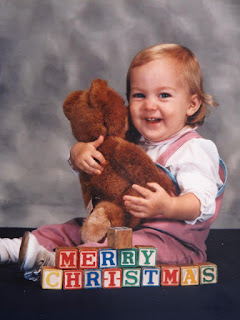 A Christmas lover from birth. We both come from families that are big on Christmas traditions, so it was admittedly a little tough for both of us to tell them that we would be flying solo (together) for the holidays this year. I am a big Christmas fan. Huge, actually. It is hands down my favorite time of the year so I did find myself missing some of our McGee family traditions more than I thought I would-- arriving at church 2 hours before Christmas Eve mass to ensure we have an entire pew for our family (okay, I don't REALLY miss doing that), exchanging gifts with my siblings on Christmas Eve, listening to Christmas music by the Carpenters and John Denver featuring the Muppets (does anyone else remember this classic? ), Dad making everyone wait upstairs until he has the video camera set up perfectly on Christmas morning and then having to announce the date and each gift that's opened into the camera while sporting some good looking bedhead. Oh, and cooking Christmas dinner with my mom is much nicer than cooking it by myself, although when you're making Christmas dinner for two the amount of dishes to wash is much fewer. This is a plus. What I missed most though was the general noise of my big family and the feeling of having them all around to celebrate with. 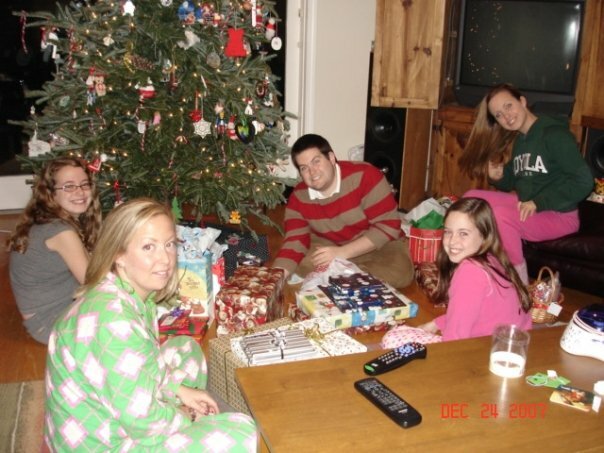 Christmas Eve 2007. Before Alex, Danielle, and baby Maeve joined the crew. Our family of two is obviously much quieter, though I know it will get larger and louder in time. This holiday was a little bittersweet and how could it not be? It's actually the first Christmas that I have ever spent without my family and not at our house. That's a big deal to me and making sure that we all woke up in our own beds at our own house on Christmas morning has always been a big deal to my parents too. This year was the start of a new tradition though (are you sensing a theme yet?) -- Christmas with my family (Alex) at my house (our Chicago loft). And it was so wonderful that we got to share some of our own family traditions with each other: I put some of those gold chocolate coins in Alex's stocking (and yes, I know they are intended for Hanukkah, but we have always had them in our stockings) and I fixed my favorite holiday beef tenderloin for dinner (more Christmas dinner details to follow on What's for Dinner Wednesday) and Alex put our filled stockings (we both have our handmade stockings from childhood, which I love) under the tree to open on Christmas morning like Santa always did at his house. He even remembered some of my family's traditions for me-- how could I forget to buy a big bag of holiday peanut M&M's and an orange for the foot of each stocking? They are small things, but so sweet that he remembered them. Merry Christmas from the Colvin's! Just like we did at Thanksgiving though, we explored some new traditions to share with our future family including, but not limited to watching It's A Wonderful Life in it's entirety (a first for both of us), a semi-botched batch of homemade cinnamon rolls for Christmas breakfast, and a halfhearted last minute attempt at midnight mass at Old St. Pat's Church (we didn't actually make it out of the apartment, but there is always next year). I don't know exactly which traditions will stick or what we will try next year or the year after that, but I do know that I want to make Christmas at our house as magical for my family as it always was for me as a kid. If you're worried and you can't sleep. Just count your blessings instead of sheep. And you'll fall asleep counting your blessings. We are so blessed to be spending our fifth Christmas together and have certainly been very blessed this year. Happy holidays from our family to yours!